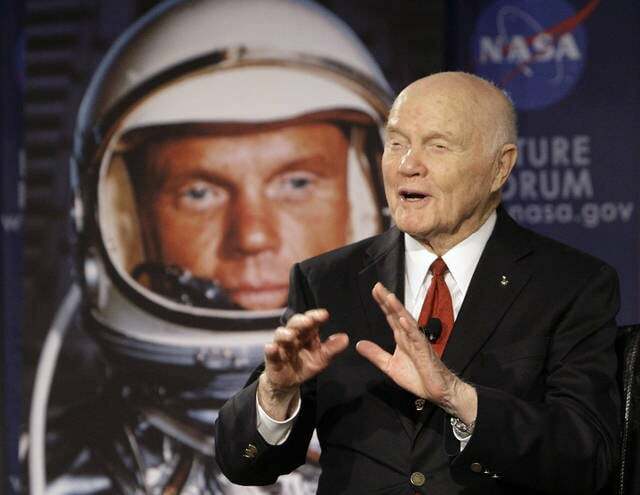 In this Feb. 20, 2012, file photo, U.S. Sen. John Glenn talks with astronauts on the International Space Station via satellite before a discussion titled “Learning from the Past to Innovate for the Future” in Columbus. Glenn’s devotees are pushing forward with ideas for memorials and honors since his death on Dec. 8 at age 95. 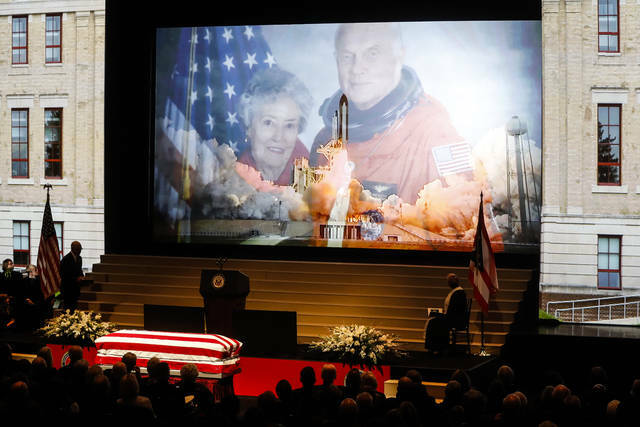 COLUMBUS (AP) — Some plans to honor John Glenn didn’t fly, but that hasn’t stopped the late astronaut’s devotees from pushing forward with other ideas. Numerous memorials and honors were being pursued as Glenn’s birth date arrived Tuesday for the first time since his death in December at age 95. They span from Glenn’s childhood birthplace and first flight school, to the starry skies over Glenn’s native Ohio, to the shores of New York where he touched down after setting the transcontinental speed record. An application to place Glenn’s birthplace in Cambridge in eastern Ohio on the National Register of Historic Places was rejected, on grounds that the Glenn family lived there only two years after his birth. The National Park Service said New Concord, site of Glenn’s boyhood home, is a more appropriate spot to honor him. 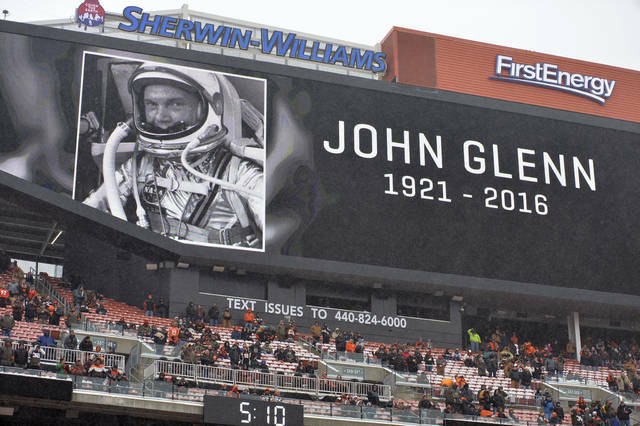 But Cambridge still thinks it has the right stuff to memorialize Glenn, the hometown boy who made history as a military aviator in two wars, a longtime U.S. senator and, most notably, the first American to orbit Earth in 1962. He became the oldest person to travel to space in 1977. Debbie Robinson, executive director of the Cambridge/Guernsey County Visitors and Convention Bureau, said St. John’s University graduate student Adam Sackowitz is working with the current owners to get a plaque placed there. In the meantime, the bureau has made one of its own. “I have a beautiful brown, Ohio-shaped sign that I just had made that I’m getting ready to give to the mayor, to place wherever he wants it,” she said. It bears Glenn’s birth date of July 18, 1921. A Glenn sculpture envisioned for the Ohio Statehouse also hit a snag, but the city of New Philadelphia, about 50 miles (about 80 kilometers) north of New Concord, is exploring placing one at Harry Clever Field, where Glenn learned to fly. Airport Manager Eric Hubbard said two airport commission members have been approached about the sculpture, but a decision hasn’t been made. In the meantime, the airport still sells its John Glenn T-shirts. In southern Ohio’s Hocking Hills, ground was broken last week on the John Glenn Astronomy Park . The Friends of the Hocking Hills, which is spearheading the project, hopes to have the project completed by year’s end. Ohio lawmaker Nickie Antonio is preparing a resolution for the fall urging Congress to award Glenn and his 97-year-old widow, Annie, the Medal of Honor. Sackowitz said he would also like to see a plaque or statue placed at Floyd Bennett Field in New York City, where Glenn touched down after setting the transcontinental speed record on July 16, 1957.